Ahhhh. This is what our boys’ room / kids’ playroom looks like now. Here’s what it looked like about 3 months ago. Before we moved in. Amazingly, we bought this house from an older couple. A couple. As in two people. 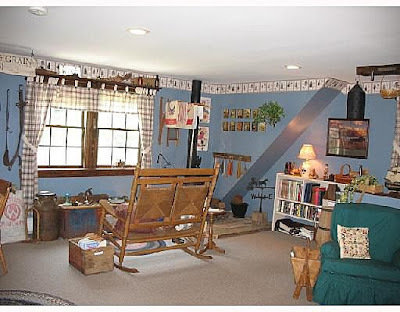 And this was a bonus room. Evidently, they had more stuff stored in their house than Solomon did in his temple. And here is where we came in. With all of our stuff. But we’ve got the excuse of having 8 (going on 9) kids. That’s enough of an excuse, right? Here we’d pulled everything away from the walls and were starting to putty up the 372, 489 holes left in the walls left from the previous owners. Sorry about the close ups, but I was trying to use my good camera. The one I have just one lens for. The lens that’s fixed, so I can not, no matter how frustrated and irritated I get, zoom out. The upshot of this dilemma of mine is that you get to see all our junk stuff. Up close. I’m okay with showing my kids’ stuff up close. They’re just kids. Their stuff is cute no matter how messy. But you’ll never see my stuff up close. You’d be so scared, you’d never come back. We decided to just go with the border, since these lovely walls were some of the only ones in the house that had NOT been wallpapered. I figured I’d take what I could get and not mess with ripping off drywall along with the lovely evergreen tree border. We painted over the border with a lighter shade of the grey we used on the walls. It’s a *gasp* R@lph Lauren color that I had made into a Valspar color. I love it when I can beat the system like that. And there you have it! Our multi-purpose kids playroom / boys bedroom. The boys had an option to share just a regular bedroom, but they opted to have the big dog, even if it meant sharing it sometimes with the littles. It’s above a 3-car garage, so it’s, um, about so many feet by about er, well… it’s big. It makes me feel happy inside just to look at it. GREAT playroom!! You did a fabulous job!! Love it! Great before and after photos! Love it! You've inspired me again. Oh, I did use some info from your living room redo! Check out the paint I went with on our blog. Thanks for the suggestion of Lowe's EB collection/Valspar– LOVE IT… and that's a first. Now to paint the rest of the room! Amazing!! Don't you just love all those little holes in the wall… Makes you want to never hang anything again!! I also noticed the nice blue divider line, LOVE it!! Looks great! I would LOVE a bonus room. Ok, I gotta ask since nobody else is. Is that blue painters tape on the floor? I just laughed because I figured the boys were telling the little ones this is their boundary! I'm loving the property line marked out on the floor! Congratulations on a project well done! You should be very proud of yourself and I know the kids are thrilled! PLEASE post a picture once it is messy. It would make me feel so much more human. Great job…I would want to stay in that room too. What a change…it looks terrific! I like the serenity of clean, organized home but around here, it only lasts a few hours. Enjoy it until they come home from school to play in it! Love it!!! What a transformation. I love that you are putting all the boys in one big room, great idea. I was just wondering, how long do you think it will stay that clean and organized? With boys, my guess is about 10 minutes. Wonderful job! And you saved more than money going with Valspar, by the way. I have some RL paint that I used in my son's room and I can tell you it chips very easily. I will never use their paint again, but I love Valspar paint! Easy to use, glides on easily, covers well.